Yoko Taro is an absolute genius. He hasn't produced a huge number of games over his career to date, but what he is best known for; the Drakengard series, as well as NieR, have been right up there with the best games that you'll ever play. Related reading: Why NieR is the greatest game ever. Taro's games are perhaps best characterised with their intense depth. Beneath the base surface story these games is near-endless thematic depths that continues to reveal more the more that you dig. The more you think about what's going on, the more you are rewarded. Taro-san himself doesn't tend to talk up the constant reflections on existentialism, religion, spirituality and morality that his games explore, but they are there, always accompanied with a healthy taste for surrealism, self-depricating humour, and complex, transgressive storytelling structures. NieR was the game that you needed to complete over and over again to get a proper picture of what's going on, after all. NieR: Automata, Taro-san's upcoming game on PlayStation 4, is much the same. Busy as he is with the game launch, Taro-san still took some time to answer some questions about what inspires him, how he goes about working on his games, and the storytelling elements that are most important to him as he writes and produces his games. 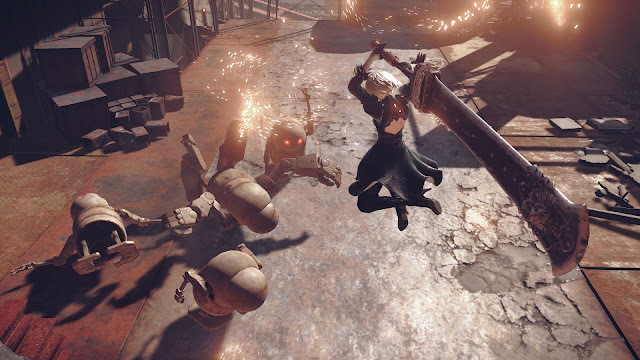 Digitally Downloaded (DD): I must admit we never expected that we'd get another NieR game! Was it always your intention to produce NieR: Automata, and were you worried that it wouldn't happen after Cavia shut down? Yoko Taro (YT): The first NIER was not really considered to be a commercial success so people really didn’t expect us to revisit the series. 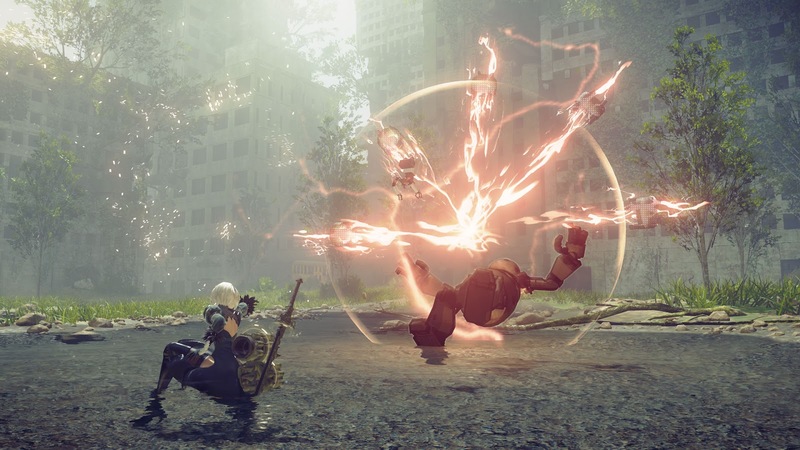 We knew that if we wanted to make another NIER it would have to be a success and we would have to build on what was considered the weaknesses of the first game to do this. For many, some elements of the gameplay were a sticking point and that is where PlatinumGames came in. Their expertise in this field are unprecedented and they seemed like the perfect fit. It was also really great to find out that a lot of the development team at PlatinumGames were huge fans of the first game so we could trust in them to protect that which is the essence of NIER, whilst adding in all of the elements that make PlatinumGames so great. DD: We actually rated NieR as the most important game of all time. I know you're not a big fan of this kind of praise, but it really was a game that has become feverishly popular within its cult audience. Was there any pressure to "recapture" the magic with this one? YT: I am not too up on the information coming out of the English speaking world, so I did not know that. I am very happy with it though, as I had not set out to create the “best game in the world” but a game that “someone will be unable to forget”. I would like for the new NieR to be thought of in the same way, but that is not something you can do deliberately so I don’t really feel any pressure on that score. DD: There's quite a lot of academic analysis that you can apply to your games, in terms of their philosophical depth and so on. I've read in previous interviews with you that a lot of that is more the interpretation of the player than anything you intended on putting in your games, but are you interested in philosophy, or have studied it in the past? I'm just keen to know where your storytelling comes from! YT: I am personally interested in philosophy and psychology but I have never deliberately employed these. It is actually more the case that the nature of the real world has a big influence on my works. I am not all that interested in grand themes like how the world came to be the way it is or the direction it is going in, and am much more interested in the human relationships that occur within the 10m radius around myself. So the stories I write don’t look at the “fate of the world” so much as focus on the more personal level of how people live their lives in a harsh and unfair world. DD: Aesthetically, NieR: Automata seems closer to NieR than PlatinumGames' usual work; I take it then that it's your sense of art direction; what effect are you looking to have on players with your world-building? YT: For the environments in the world, the design process is quite simple for me. I basically gave a selection of very simple key-words, for example; a rusty decaying factory etc., to the guys at PlatinumGames and they did the core work themselves to bring it to life. What they came up with was so great right from the start. I really don’t like bright and garish screens so I always tell the team to tone it down and half the exposure when editing etc. When coming up with the ideas for the landscape one thing that I did want was for environments to feel intriguing, almost like tourist experiences, that if in the real world people would want to explore and discover. 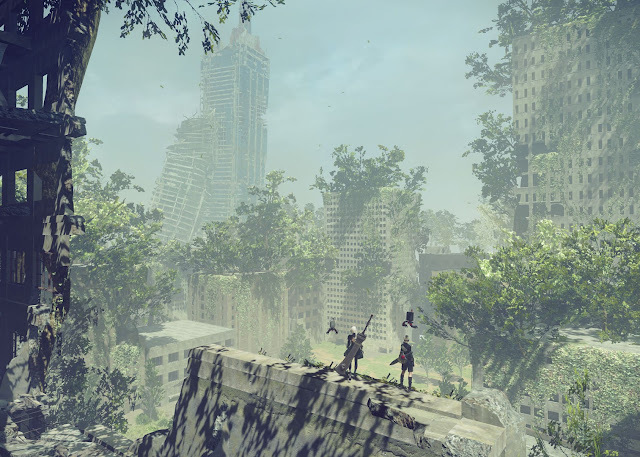 DD: One of the most memorable parts of NieR is, of course, its incredible soundtrack (and NieR: Automata seems to be much the same). How closely did you work with the composer to come up with such a distict and incredible soundtrack? YT: When people praise the music more than they do the game, it sets off a burning flame of jealousy within me! But if I suppress that for a moment to answer your question, then the way I direct most of the BGM is to send the composer samples from MP3s or YouTube clips and ask him to “do something like that”. In actual fact, this manner of directing is seen as very rude by most composers, but Mr. Okabe is a good friend of mine from our University days so I can make these pretty flagrant requests because it is him. DD: Do you draw inspiration from other art mediums at all? 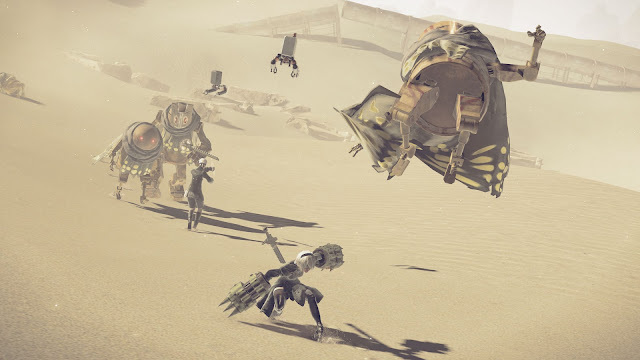 Whenever I've written about NieR and Drakengard I've always felt that they should be written about more like how we write about film or literature than games, so I'm wondering if there's particular films or similar that you've wanted to recreate as games. YT: I always want to try showing things that can only be done through the medium of a game. To go further, I also want to show things that have never before been depicted through games. In that sense, I feel it would be fundamentally off base to think about the stories from films or novels. However, in making games I often use structures from the world of cinema, so I am very happy when people talk about my wok being “like a film”. There aren’t really all that many works I would like to convert into a game. Pretty much none at all. However, the novel “Hybrid Child” by Ohara Mariko is like my personal bible, so that is probably the one and only story I would like to make a game based on. DD: Your games tend to be quite transgressive in the way they constantly disrupt expectations. Is it deliberate intent by you to deconstruct the way that people make - and play - games? YT:Rather than a deliberate attempt to disrupt, I think that actually comes from how easily I can get bored. If what the next development is going to be becomes obvious, then I lose the motivation and will to create the game, so I am constantly altering the story as I make it. DD: What is it about the JRPG genre that you enjoy working in? Has there ever been another style of game that you'd like to make? YT: I would like to make a vertical scrolling shooter. Related reading: Dragengard 3, also by Yoko Taro, is also essential. Matt's full review. DD: Finally, what kind of games do you like to play yourself? YT: I am currently looking forward to Legend of Zelda: Breath of the Wild and Horizon Zero Dawn, but both of those are coming out close to NieR: Automata’s release date so it is problem. But I am still looking forward to them a lot. I also cannot wait for the next game from The Last Guardian creator Ueda Fumito.